5 fun things you should try on Google! We are quite used to all the innovative Google Doodles, the hidden Easter eggs, the April Fool coded jokes and the in-search calculator that Google has been using to lighten up boring days in the office and bring a smile on the faces of a million users. For the uninitiated, virtual Easter Eggs are sound bites, graphics, videos, text or any other unusual features used as hidden in-jokes on any software or on the internet. Here are a few fun Google tricks that you MUST try out! Would you like to see your Google world become all topsy-turvy? All you have to do is check out Google Gravity for a dose of looking at the world with a crooked eye – literally! Simply enter ‘Google Gravity’ in the Google search bar. Enter ‘I’m feeling lucky’ and watch Google fall down. Did you know that Google Pacman Doodle was blamed for the loss of productive work hours and dollars running into millions? Launched in 2010 to mark Pacman’s 30th birthday, Google saw almost double an increase in the search hours and the time spent by users across the globe on its site. 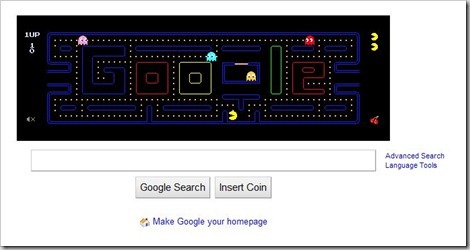 It you want to play Google Pacman with two players, click on ‘Insert coin’ on the permanent Google Pacman page. You can use the arrow keys as one control set as the characters W, S, A and D as the other. Happy Pac-manning! After trying out Askew, you’ll probably hit yourself in the head thinking why you fell into the trap of trying it out in the first place! But sometimes stupid things are fun too. 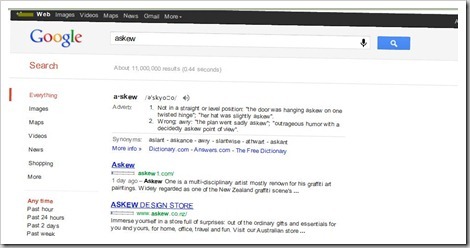 Type ‘Askew’ in your Google search bar and watch your page turn diagonal. It’s a perfect joke you could pre-place on the screen of that irritable colleague of yours to spoil his/her morning. Did you always think Google Translate was a squeaky clean service that helped users to translate phrases from one language to the other? Well, there’s a little more quirkiness to it than you thought. Go to the Google language tools page and closely look through the options you’ve got under ‘Google Interface in your language’. Can’t find anything different? Look closer and you’ll see language options of Elmer Fudd, Pirate, Bork Bork Bork, Klingon and Hacker in the list of languages. Have a good laugh with ‘Images’ reading as ‘engravin’s’ in the Pirate language and ‘About Google’ reading as ‘Ell Ebuoot Google-a’ in the Swedish muppet chef’s cool lingo Bork. bork. For joy that lasts perfectly for a period of 5 seconds, you must do a barrel roll on Google. Type in the same phrase [Do a barrel Roll] in your Google search bar and watch the Google homepage do a hoola hoop. Probably more amusing for the lesser internet savvy, it ruffled enough feathers when it was released. It became the talk of the blogosphere as it displayed the qualities of CSS3, a feature of modern internet browsers. By the way, ‘do a barrel roll’ is a phrase which means 360 degree spin. View a host of other Google Easter Eggs that Google has now removed. This is what I love about Google – They have lots of fun elements in the way they operate! What say? "5 fun things you should try on Google! ", 5 out of 5 based on 1 ratings. Thanks very much for including a link to my article :) All the best. I was knowing about Google Gravity but rest were unknown to me. Thanks a lot for sharing. This is December not April but still we can make some one fool with it. Just loved all the five.